To broaden the visions of young scholars, the Taiwan Ministry of Education has worked with University of Cambridge, University of Southern California, California Institute of Technology, Washington University in St. Louis and Australian National University to provide graduate and professional students with an extraordinary educational experience at top 10 leading universities in the world. Five scholarship recipients are selected for each university every year. 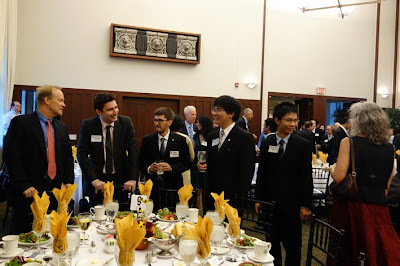 The McDonnell International Scholars Academy at Washington University in St. Louis welcomes Taiwan young scholars on September 10, 2013. The McDonnell International Scholars Academy at Washington University in St. Louis was founded in 2005 with an initial endowment gift of $10 million from john F. McDonnell. The main theme of this program is to focus on energy, environment and sustainability and to learn more about the global community. In creating an international network of research universities, Washington University intends to develop a cohort of future leaders in a global university system and promote global awareness and social responsibility. Scholars are important to the research effort at Washington University and to raise the educational experiences of domestic students by the way of sharing their own culture and history of their countries. A special feature of the McDonnell Academy is that each Scholar has a mentor. Each mentor also serves as an Ambassador. Professor Tuan-Hua David Ho is appointed by Chancellor Mark S. Wrighton to advise those scholars from Taiwan. He is a Professor in the Plant Biology, Developmental Biology, and Molecular Genetics programs of the Division of Biological and Biomedical Sciences at Washington University. He is an academician of Academia Sinica, Taiwan; a fellow of the American Academy of Arts and Sciences; and a fellow, TWAS, the Academy of Sciences for the Developing World.